This Paleo coconut flour bread is good for sandwiches. It looks and tastes so similar to a honey wheat bread, thanks to the honey and flax meal. Homemade bread is always one of my favorite smells to come home to. I had a roommate that would always make her own bread instead of buying store-bought bread and it was amazing! We always had freshly baked bread that semester! Now that I don’t eat “normal” bread I have been on a mission to find/create the best recipes for good bread. I wanted a recipe that used coconut flour so today I have a Paleo coconut flour bread recipe to share with you. I hope that you enjoy the recipe and let me know what you think. 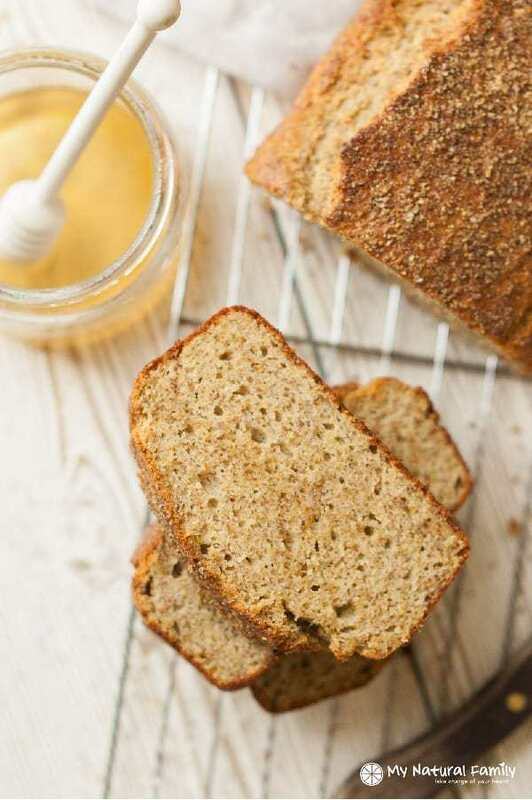 This Paleo coconut flour bread looks and tastes so similar to a honey wheat bread, thanks to the honey and flax meal. The flax meal gives the bread a somewhat chewy texture while the arrowroot starch helps hold it together (which is highly unusual for a Paleo bread to hold together like this). One of the things I love about bread is how versatile it is. Obviously, you can use for a sandwich, but there are other good things you can use this for, such as a side dish with your dinner, for stuffing/dressing, as a snack on it’s own, as toast with almond butter spread on it hot so it half melts, topped with butter or coconut oil and broiled, to make a breakfast egg sandwich, and the list goes on and on. How do you like to use your Paleo bread? I would love to know how you use this. Please comment below. 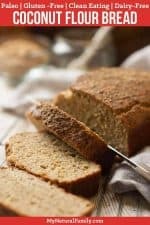 This Paleo bread looks and tastes so similar to a honey wheat bread, thanks to the honey and flax meal. 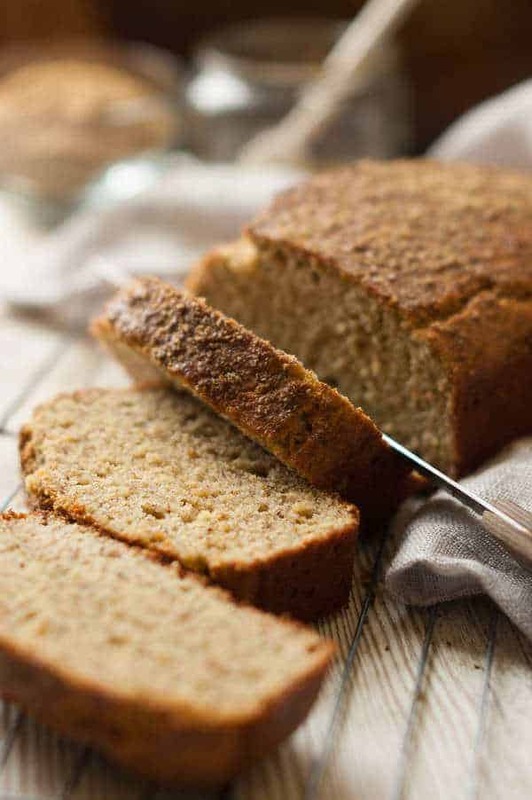 The flax meal gives the bread a somewhat chewy texture while the arrowroot starch helps hold it together. Preheat the oven to 350 degrees. Grease and flour (use coconut flour) a standard 9″ x 5″ loaf pan. In a mixing bowl, combine together the coconut flour, arrowroot starch, flax meal, baking powder, and salt. In another bowl, mix together the egg yolks, melted coconut oil, coconut milk, and honey. Mix together the dry and wet ingredients(not including the egg whites). Add half of the egg whites and stir in to combine. Add the remaining egg whites and very gently fold in to the mixture. Mixture will be thick as you first start folding the egg white in, but keep carefully folding and it will become smooth. Take care to not over-mix. Scoop the batter into the prepared loaf pan. Sprinkle a little flax meal over the top of the batter and bake in the preheated oven for 40-45 minutes. Let cool in the pan for 10 minutes then remove from pan. I have 9 of the best Paleo coconut flour bread recipes to share with you. Coconut flour is a great flour to use for a Paleo lifestyle, gluten-free or Clean Eating recipes. Coconut flour is especially good for bread recipes. Coconut flour has it’s own characteristics so these recipes will only turn out good if coconut flour is used in the recipe. Coconut flour typically tends to need extra liquid for the bread to achieve a good texture and flavor. Don’t try to substitute other kinds of flour, because the bread just won’t have the right consistency. Coconut flour is great because it is not a refined grain plus it is gluten-free. So if you are looking for good coconut flour bread recipes that are free of gluten and Paleo, then this is a great place to be! Coconut flour is not just a product for gluten intolerant people but has benefits for everyone! This flour is high in fiber, manganese, lauric, and protein. I hope these Paleo Coconut Flour Bread recipes are helpful and that you enjoy them and find some that become your favorites. I don’t consider coconut bread fattening. Coconut flour is high in protein, fiber, and healthy fats. It’s also low in digestible carbs, low in sugar and lower in calories. On the glycemic index, it has a low score. What is the healthiest type of flour? All things considered in order the healthiest flours are: coconut flour, sprouted flour, oat flour, rice flour, tapioca flour, chickpea flour, sorghum flour, and cassava flour. How many carbs are in coconut flour? Compared to almond flour which has 6 grams of carbs, coconut flour has 16 grams of crabs for the same amount of flour. NO, coconut flour is extremely absorbent compared to any other type of flour. There is no way you can sub coconut flour straight across for any other flour unless you want to gag when you eat whatever you made. Can coconut flour go bad? The shelf life of coconut flour is like any other flour. It will keep for a long time, but the longer it sits without being used, the staler it will taste. This Paleo monkey bread is perfect for any special occasion. I think it’s especially good for breakfast or brunch on Christmas morning. They have a little bit of sweetness without going overboard and being dripping with sugar like the original recipes. I like these a whole lot better. This is a basic Paleo flatbread recipe which is incredibly versatile. That’s because you can either eat it plain or you can top it with whatever your heart desires. Included is the recipe to top it with roasted butternut squash. Other ideas of things to top it with are rosemary, garlic, and sea salt. You could also do avocado or guacamole topped with sunny-side-up egg, tomato, and bacon. Other ideas are to brush it with coconut oil or butter, garlic and basil and dip it in pizza sauce. Or you could make a base of Paleo pesto with roasted tomatoes. See how the ideas are endless and you could come up with your own and share them with us too. This recipe uses both coconut flour and almond flour, which creates a light texture and is not super heavy or dense like a lot of coconut flour bread recipes. This is a good grain-free bread option. This recipe is for a paleo baguette loaf. This recipe is a good option for someone who eats paleo and needs a low carb diet as well. This recipe uses psyllium husk powder which comes from psyllium seed and it soaks up a lot of moisture and is a great source of fiber. This paleo bread recipe is as simple as mixing the ingredients together and then in 5-10 minutes, you have a fresh loaf of homemade in the oven. This bread is a good option for families with more than one food restriction as it is gluten free, grain free, yeast free, and low carb. This bread is more like dessert but it’s still bread. It’s the perfect combination of chocolate and almond butter but in bread form. Those are three of favorite foods so I’m pretty much combining my three favorite food together to make something delicious. The best part is that it’s super easy to make. You mix it all together in one bowl and it only takes 15 minutes to bake in the oven. You don’t even need a mixer. I used applesauce and a small amount of maple syrup to sweeten it so you don’t even have to feel guilty about eating it because it’s actually fairly healthy. This is a light hearty coconut flour paleo bread that will taste great for a sandwich, with a meal, or toasted with almond butter, jam, or another spread of your choice. Here is another low carb recipe that uses a combination of coconut flour and psyllium husk as the main ingredients. It helps balance the recipe out if you are looking for a not so strong of an eggy taste. I’ve been making paleo breads for over a year and half and this is the best bread recipe yet. The flavor is like a toasted honey wheat, yet very moist. I sure don’t have to keep looking since it can’t get any better than this. Thanks so much for sharing. Glad to help! Thanks for the great review. What are the measurements of the loaf pan that you use? Just a standard 9″ x 5″ loaf pan. Hi! It seems great! Iam really gonna do it! The calories are from the whole bread or just a piece of it? Thanks!!!!! I apologize if I missed it in the blog section, but how many servings should we get from this loaf of bread? It’s kind of hard to find, but the servings are in the orange boxes above the recipe. You should get about 10 servings from this recipe. I’m glad you like it! Thanks for commenting and I hope you can find some other good recipes on my blog too. Due to egg allergies, I’m wondering if I can substitute applesauce for the eggs and still have the bread turn out? Thanks! HI! I want to try this. I can’t have tapioca or arrowroot so was wondering if you can suggest an alternative? I don’t know of one, but I’ll post your comment in case someone else knows of one. Wow! This bread is amazing!!! Finally truly the best paleo bread I’ve even made! Thanks so much!!! Thanks for the nice comment. I’m so glad you like it! I’ve tried many coconut flour bread recipes. This one is the best!! My family really liked it and that’s saying something since they would not even try the other coconut bread recipes I baked! Instead of flax seed meal I substituted almond flour and it turns out really delicious! I’m so glad you like it – and thanks for the tip about the almond flour. I’m sure it will help other people. Best paleo bread I’ve made in 5 years. Love that it’s nut free. I did have to use tapioca, I was out of arrowroot. I’ve subbed that way many time so in other baked recipes, so I knew it would work. Made French toast, amazing! great recipe thank you! I’m so glad you like it and it worked out for you. French toast sounds so good and I’m sure other readers will be happy to know that tapioca flour works well too! I have 1 more question: is the coconut milk full-fat canned coconut milk? Thanks! Yes. That’s the only kind I use. I’m excited to try this! Can I replace arrowroot starch with cornstarch? That’s all I have on hand. If a replacement is possible, would I do the same amount, 3/4 Cup? First off, cornstarch isn’t Paleo, if that’s what you’re going for. Second, I haven’t tried cornstarch myself in this recipe, but it’s supposed to be pretty similar, but it’s not exactly the same, so it would probably turn out, just maybe not be the same. This was amazing! We’ll probably make it weekly now. Thank you so much!!! I’m glad you liked it! Thanks for commenting. So good to hear! Comments like this make me happy to know that all my hard work is paying off. I was wondering can you use tapioca starch instead of arrowroot? I haven’t tried it myself but they are quite similar so there’s a pretty good chance it will work. Please let me know if you try it so others will know if it works. Do you know if this recipe could be made in a breadmaker? If so, what modifications would need to be made? I am not sure. I am sorry. Yes flax meal is ground up flax seed so you can’t do that. I am sorry about that! I used Quinoa flakes & it turned out pretty good. Delicious! I added cherries and wish I had added bananas and chocolate too. Is there a reason this wouldn’t work? Not that I know of, give it a try and let me know how it works out! I just made it and it turned out fabulous. It was delicious and will definitely be my new go to bread. Even my dad liked it and he’s very picky with all my “healthy” cooking. Thanks for the recipe! you are welcome! I am glad it worked for your family so well! This looks great! I’d love to try it for a friend who has a very restrictive diet, and she can have everything here except the yolks. Is there any way to salvage the recipe using an alternative to the yolks? Applesauce or flaxseed eggs? Thanks! My personal thoughts are that coconut flour requires a large amount of eggs and so I would be hesitant to substitute them but I would also say it doesn’t hurt to try it. I would love to hear about the results if you decide to give it a try! Best of luck! Hey I was just wondering if I could use normal store bought honey instead of raw honey? Will it turn out the same? It’s really hard to get raw honey in my area.. Yes. It will turn out the same and actually, if you cook with raw honey it cooks out the benefits so lately I’ve started using cheaper honey when I know it will be cooked to save some money. I have had coconut flour for a while now and made enough recipes with it to know I need some better ones. I’ll give yours a try. Thanks! Hello, I just tried making the bread today, it didn’t come out too well. It didn’t rise at all just baked when I tired to cut a slice it was soft but didn’t fall apart so I know that’s a plus. Would you be able to possibly tell me where I might have gone wrong? If the bread didn’t rise at all, it’s likely that the batter may have been over beaten. 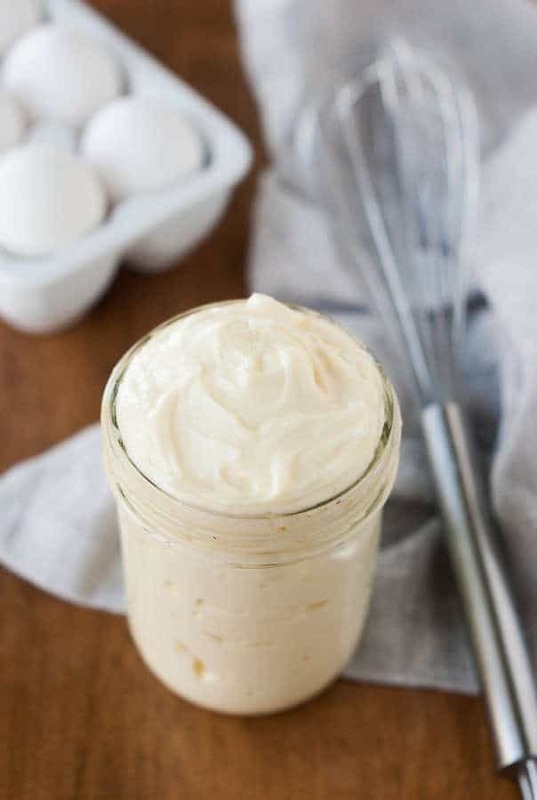 The egg whites are what make it rise, so if they weren’t folded in gently enough it can cause the batter to deflate. I will look at this because I am having real trouble making paleo friendly bread. It all turns out hard as a rock! Great recipe, but 7 EGGS. You will get high cholesterol in no time. Can you cut back the eggs or substitute with something else. Find 7 eggs in a small loaf of bread, not exactly healthy. Coconut flour is extremely absorbent so that many eggs are necessary and normal for coconut flour. I’m assuming you haven’t researched the Paleo diet or read current research on eggs if you think eggs give you high cholesterol. . . This is great! It’s exactly what I was looking for to replace the regular french bread in my eggnog french toast! Yay! My favorite Christmas recipe is restored! That looks delicious! I’m wondering though for a friend who is allergic to coconut, what would you suggest to modify this to be safe for her? I am thinking maybe almond flour and almond milk with olive oil? Thank you! Unfortunately, this recipe is entirely based around using coconut flour, and as paleo breads are quite difficult to figure out, you wouldn’t really be able to just sub different flours as they have very different properties and you would need different ratios of all ingredients. Sorry! I would suggest looking for a paleo bread that specifically uses almond flour. I’m a diabetic, also a complete novice at baking; is the honey necessary? You need to have some sort of sweetener or it won’t rise properly so you could substitute another sweetener as long as it will rise. For example, I know xylitol says not to use it in baking. I am diabetic as well, but find that 2 TBS of honey is not an issue. What you want is low carbs instead. If you watch what you add to the bread (i.e., toppings), you should be fine. Doing Paleo has made my A1C drop in half and cholesterol dropped 130 points!! Yah Paleo. The dietitian just could not wrap her head around Paleo and low carbs. Everything she told me to eat was high carb and oh, yes, filled with gluten which I am also unable to eat. I love this site as it helps me stick to my Paleo eating plan. Yes, I had the same experience with a dietitian. They are totally clueless in Paleo and low carb eating for diabetes. 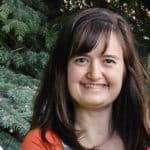 My HA1C came down to 5.9! I haven’t been real careful this last 3 months and will see what it is now. But can tell you Paleo is the way to go. I used low glycemic organic blue agave instead of honey and the bread turned out great. Even though I am not diabetic, I know that this type of agave is okay for diabetics. I have been trying to eat low carb and low sugar for dietary reasons so I usually make the switch to much success. Hope that helps. I also just want to say thank you to this recipe’s creator. This bread is REALLY good and since I’ve been clean eating and cutting out processed foods I have yet to find a bread recipe that is palatable. But you did it! Thank you so much! I will certainly be recommending this to all my clean eating buddies. Oh, I’m so glad you like it! Bread is especially hard to do on the Paleo and Clean Eating diet. Here’s that breakdown for you – http://myrecipemagic.com/recipe/recipedetail/paleo-coconut-flour-bread-recipe Click on the Nutrition tab.